The Ritman Library received the Paracelsus Award from the hands of Dr. Juan Carlos Avilés, director of Heliosar Spagyrica during the VI National Symposium on HomeoSpagyria in Madrid. The award was created in 2014 to honour the achievement of individuals or institutions that contribute or have contributed to the retrieval, in the West, of traditional knowledge of advancing its dissemination in the domain of health care and promoting its cultural value in the face of a future that will necessarily be holistic and inclusive. Director Esther Ritman and deputy director Rixande Oosterwijk were invited to accept the award in person on behalf of The Ritman Library. 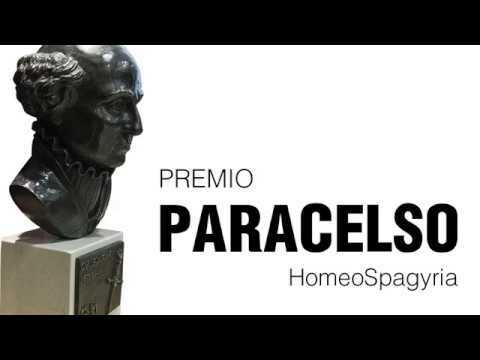 — The HomeoSpagyria Paracelsus Prize, awarded by the Society of Studies and Spagyricas Research (Societas Educationum Investigationumque Spagyricarum – SEIS) for the purpose of distinguishing the work of individuals or institutions that contribute or have contributed to the recovery in the West of traditional knowledge, has awarded in this new edition the Bibliotheca Philosophica Hermetica, also known as the Ritman Library, and Dr. Frans Snel, with the prize. The event, which took place in Madrid during the celebration of VIO National Symposium HomeoSpagyria, has brought together more than one hundred people who joined the winners from The Netherlands to receive the award in a day of affection and emotion, which ended with the traditional annual dinner celebration. — We, my daughter Rixande and I, are greatly honored to accept on behalf of the Bibliotheca Philosophica Hermetica the annual Paracelsus Award. I also would like to thank you most heartily for the generous contribution of publications by Editorial Tritemio. They will be placed on the shelves of the library as soon as the House with the Heads reopens! Thanks to Frans Snel, who acquainted us with your work, we were delighted to discover that your company Heliosar Spagyrica exemplifies the practices of Paracelsian principles. What nature produces is not complete in itself. It is man’s task to strive for completeness. This act of ‘completion’ is called Alchemy. The first and principal book of all medicine is called Sapientia. Without this book, nobody will be able to perform anything that is good and fruitful. This is wisdom, or Sapientia: that man possesses knowledge, is aware and does not assume. And last but not least he said that a physician is born in the heart, as the highest ground of medicine is love. I am sure many of you present here today will recognize these ideas. During the symposium Dr. Juan Carlos Avilés presented the Spanish translation of Heinrich Khunraths’ Amphitheatrum Sapientiae Aeternae and Una Tesis sobre Medicina Popular by Frans Snel, both published by Editorial Tritemio. — The Bibliotheca Philosophica Hermetica in Amsterdam was founded by Joost R. Ritman. He started collecting books in the fields of Hermetica, Alchemy, Rosicrucians, Mysticism and Western Esotericism at a young age. When in 1984 he turned his private collection of books into a library, it was his vision to bring together under one roof not only the manuscripts and printed works of the Hermetic tradition, but also to show their relevance for the present day. Until this summer, the library was located in a small street in the centre of Amsterdam. There it welcomed the public, offering the use of its collections and presenting thematic exhibitions geared to a wide audience. The library also has its own publishing house, called ‘In de Pelikaan’, which brings out text editions, monographs, exhibition catalogues and conference proceedings in three separate series. The publications mainly issue from The Ritman Research Institute, which conducts historical, philological and bibliographical research in the collecting areas of the library. The Bibliotheca Philosophica Hermetica – BPH for short – is named after Hermes Trismegistus, but it has a vested interest in the works of Paracelsus, who was already celebrated as ‘Trismegistus Germanus’ by his followers in the sixteenth century. This epithet is certainly deserved: thanks to Paracelsus, the Hermetic tradition found a far greater dissemination in the German lands than in other countries in Northern Europe. Paracelsus also created the language and the terminology to enable this dissemination. The BPH acknowledged the seminal influence of Paracelsus in an exhibition, Paracelsus in der Bibliotheca Philosophica Hermetica. It was curated by its emeritus librarian Dr Carlos Gilly to commemorate the 500th anniversary of Paracelsus’ birth in 1993. Paracelsus was also a major presence in two international exhibitions curated by the BPH in Italy, where the works of Hermes Trismegistus were first translated into Latin and printed, already in 1471. Thus in 1999 the BPH opened an exhibition in the Biblioteca Laurenziana-Medicea in Florence, called Marsilio Ficino e il ritorno di Ermete Trismegisto. This exhibition was followed in 2002 by s sequel in the Biblioteca Marciana in Venice under the title Magia, alchimia, scienza dal ’400 al ’700. L’influsso di Ermete Trismegisto. Both exhibition catalogues were reprinted, while the two exhibitions together drew more than 75,000 visitors. During the next years the exhibition Divine Wisdom, Divine Nature: The Message of the Rosicrucian Manifestoes in the Visual Language of the Seventeenth Century is touring Europe. Like the previous exhibitions in Italy, it again pays homage to Paracelsus as one of the great forces behind the ‘Hermetic revival’. The Rosicrucians were, after all, inspired Paracelsians. Indeed, Paracelsus is mentioned by name in the Fama Fraternitatis, the first manifesto of this illustrious brotherhood. The travelling exhibition ‘Divine Wisdom – Divine Nature’ opened in Germany in 2014, four hundred years after the Fama Fraternitatis was published, was on show in Basel and Amsterdam in 2015 and will open in Cracow in Poland next month. Hungary and the Czech Republic are also on the agenda – who knows, perhaps Spain will also be included in the itinerary! Now, more than thirty years after its founder, Joost R. Ritman made his collection available to the public, two new generations are at the helm, ready to carry the great project forward. Mr Ritman’s daughter Esther Ritman, director and librarian of the BPH, and his granddaughter Rixande Oosterwijk, deputy director of the BPH, are driven to make the collection ‘Hermetically open’ to all and to lodge it within the public domain. In 2012, Esther Ritman took the initiative for the Hermetically Open Project, an online communication project that is able to address all those who are interested in exploring and sharing the transformative nature of Hermetic wisdom and its influence in all areas of art, science and religion in the Western tradition. Thanks to Dan Brown the core collection (4,600 books and manuscripts) of the library will be digitized and integrated in a new online catalogue. In a week from now, Picturae, a company specialized in digitisation of heritage material, will start on the first batch of books lined up for digitisation! This massive digitisation is carried out now because the library will be moving to far grander premises on one of Amsterdam’s canals, the seventeenth-century House with the Heads. But not before the house, which was built in 1622, is thoroughly renovated. Like the House with the Heads, the BPH is inseparably connected to Amsterdam and its history of free and open thinking, freedom of speech and freedom of the press. During the next years the House will be transformed into an Embassy of the Free Mind. The BPH, with its wealth of knowledge and its unique collection of 25,000 manuscripts and printed books, will be the vibrant heart of the Embassy of the Free Mind. Its collection can be described as reflecting man’s search for the meaning of existence, as a “treasure house of the human spirit”. Man’s inner perception has always grown independently within the major religions and the community, but the free expression of that perception, the ‘free word’, has virtually always been compromised. Free expression has been suppressed and marginalized – people have been persecuted and their books have been destroyed.